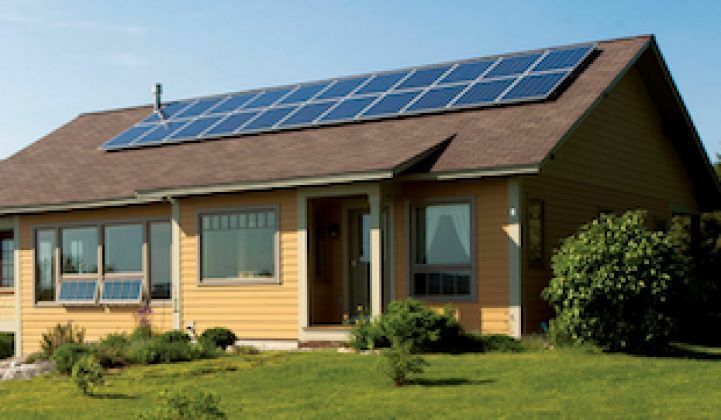 A Republican mayor campaigns for a historic requirement for solar on new homes. Rex Parris, the mayor of Lancaster, California, wants every new home in his city to host solar. And starting next January, that could be a reality. Yesterday in Lancaster, homebuilder KB Home celebrated its 1,000th new home with solar panels from SunPower. Speaking at the event, Mayor Parris announced his city will institute a first-of-its-kind requirement that solar be installed on every new single-family home built in Lancaster after January 1, 2014. The new law will be written into Lancaster’s “Residential Zones Update” on residential solar. Along with a range of green building provisions, it specifies that new single family homes meet minimum solar system requirements. Residential homes on lots from 7,000 square feet must have a solar system of 1.0 kilowatt to 1.5 kilowatts. Rural residential homes of up to 100,000 square feet must have a system of at least 1.5 kilowatts. Builders of subdivisions will be able to aggregate the houses’ requirements. If ten houses in a subdivision each have a 1.0 kilowatt requirement, the builder can install a single 10-kilowatt system, two 5-kilowatt systems or four 2.5 kilowatt systems. Multi-family developments can meet the requirement with a rooftop system or a system on a support or shade structure. Mayor Parris, who frequently promises to make Lancaster “the solar energy capital of the world,” expressed confidence that he has the City Council votes for approval, despite resistance from the building industry. Even with resistance from some members of the building community, the market is shifting. Along with partnering with KB Home, SunPower has worked with other major home builders like Lennar Homes, Richmond American Homes, and Standard Pacific Homes.